Zachary Titus joined the 501st Legion in August of 2010, but his inspiration for joining started back when he was a kid watching the Star Wars movies. He still recalls going to the theatre to see the Empire Strikes Back on the big screen when it was on its Re-Mastered release. "It was the first time I saw a Star Wars film on the big screen and I was blown away. The shear mass I felt when I saw the AT-AT thundering along and shooting down Rebel speeders was jaw dropping. It quickly became my favorite episode", says Zachary. He originally got a set of armor just to have a suit to show off but it later developed into wanting to be a member of the 501st Legion. "The whole "joining something greater than yourself" came to me when I started researching the 501st Legion and I always wanted to do more volunteer work", says Zackary. "The Legion has been one of the most rewarding things I've ever done. I love hanging out with other Star Wars fans, seeing peoples reactions when we are in costume, and playing with the kids at the events, but it also helped me find my career", says Zackary. 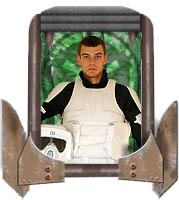 Growing up, Zackary had his heart set on being an engineer but it was through the 501st that he found something he was good at and enjoyed; making costumes. Zackary explains, "I started taking classes and workshops on design and fabrication and haven't looked back since. The 501st helped me find out what I wanted to do for a living". Since joining, he has participated in 13 events. When asked if he has a favorite, he says, "It's hard to pick any one event, but I'd have to choose the Grand Rapids Griffins Star Wars game. There were massive amount of people that wanted to get their picture with us. I was not able to move from my spot because I was horded by people and couldn't get away from pictures for and hour and a half. It was pretty insane, but in a good way!" When Zackary is not imposing the will of the Empire, he is attending classes as a full time student studying Technical fabrication and design. "That is a fancy term for costume and prop design and building", says Zackary. He recently got an internship at Disney Studios in the costume department that will last 8 months and he will be continuing school at the University of Florida and later on to grad school at FSU. "I'm constantly building and designing new costume and props and stretching the limits of what I can do with the knowledge I have and everything I know, from sewing to fiber glassing, is 100% self taught ", says Zackary. Zackary also likes to stay in shape working out and biking 40 to 60 miles a day when the weather permits. He also plays Paintball and was recently a sponsored player but mainly plays with friends at local parks now.